After the discovery of topological insulators, there were some hints that lead-tin chalcogenides may also belong to this category. This prompted groups at IFPAN, already involved in studies of IV-VI compounds, to re-examine the properties of these materials from that perspective, particularly exploring low-temperature properties of PbTe quantum wells deposited by MBE in Linz and of high-quality bulk single crystals of (Pb,Sn)Se grown at IFPAN in Tomasz Story’s lab. Immediately after the suggestion of Timothy H. Hsieh et al. [Nat. Commun. 3, 982 (2012)] that SnTe-type materials belong to the class of topological crystalline insulators just introduced by Liang Fu [Phys. Rev. Lett. 106, 106802 (2011)], Story’s group carried out photoemission studies in Sweden, that — with support of tight-binding modeling at IFPAN — confirmed beautifully Fu’s predictions [Piotr Dziawa et al. Nat. Mater. 11, 1023 (2012)] (see, Figures). This work is being continued on many fronts and in a world-wide collaboration. Among others, Matthias Bode’s group at Würzburg discovered 1D topological conducting channels adjacent to surface step edges with scanning tunneling microscopy; this observation was possible due to outstanding quality of the (Pb,Sn)Se single crystals [Paulo Sessi et al., Science 354, 1269 (2016)]. 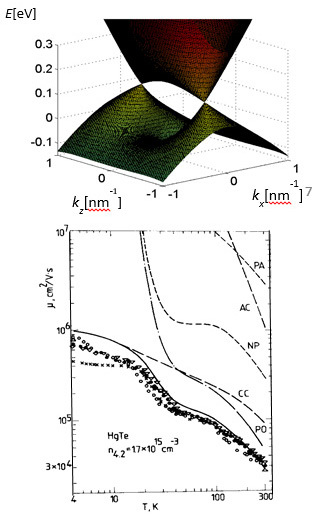 Figures: Bottom panel: photoemission spectra in Pb0.77Sn0.23Se in the topological crystalline insulator regime showing surface Dirac cones. Top panel: tight-binding computations of the surface and bulk states. Cation and anion p-type contributions to the wave functions are shown in yellow and blue, respectively. The presence of anion p-type wave functions at the bottom of the conduction band is a signature of the inverted band structure [from Piotr Dziawa et al. Nat. Mater. 11, 1023 (2012)]. A dramatic improvement in topological protection by ferromagnetic ordering in thin films of (Bi,Sb,Cr)2Te3 was demonstrated by Cui-Zu Chang et al. [Science 340, 167 (2013)] via the observation of an accurately quantized value of the anomalous Hall resistance at mK temperatures. This breakthrough finding opens the door for metrological and spintronic applications of such systems. The exploration of the physics and functionalities of dilute ferromagnetic semiconductors (DFSs) at IFPAN goes back to 1986, when Tomasz Story et al. [Phys. Rev. Lett. 56, 777 (1986)] revealed the carrier-controlled ferromagnetism in (Pb,Sn,Mn)Te, in which Mn spin ordering appears above a threshold hole density p and the Curie temperature TC grows with further increase of p.
As reviewed by Tomasz Dietl and Hideo Ohno [Rev. Mod. Phys. 86, 187 (2014)], further milestone accomplishments of IFPAN, achieved in collaboration with Grenoble and Tohoku, include (i) the theoretical prediction and the observation of 2D and 3D ferromagnetism in p-type (II,Mn)VI epitaxial structures; (ii) the development of the p-d Zener model within the multiband kp formalism and multiorbital tight-binding approximation, that describes thermodynamic, micromagnetic, and spintronic properties in a wide array of p-type semiconductor compounds and tunneling structures with randomly distributed magnetic impurities; this model is being also applied to explain the origin of ferromagnetism in intrinsic DFSs with inverted band structures, i.e., in topologically non-trivial systems; (iii) the proposal and theoretical elucidation of electric field control of TC and magnetization direction, the ideas that are now being transferred to spintronic devices of ferromagnetic metals; (iv) the demonstration that ferromagnetic superexchange accounts for ferromagnetism in insulators containing magnetic impurities in a specific spin state. A comparison between experimental and theoretical values of TC is shown in Figures. Figures: Comparison of experimental and theoretical values the Curie temperatures. 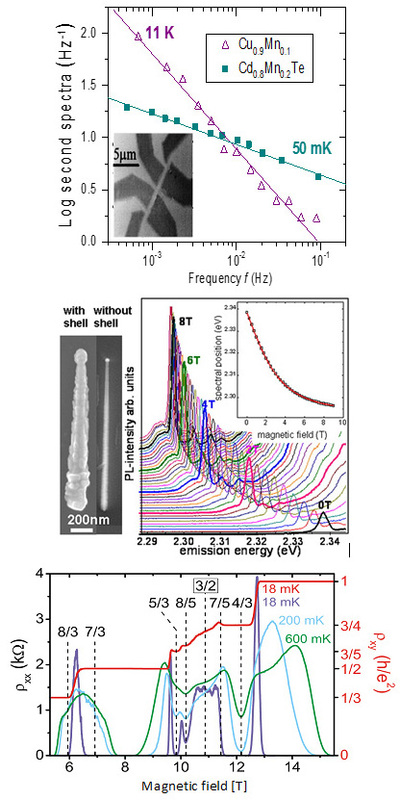 Top panel: ferromagnetism mediated by band holes in III0.95Mn0.05V compounds and described by the mean-field p-d Zener model [after Tomasz Dietl, Nat. Phys. 9, 965 (2010)]. 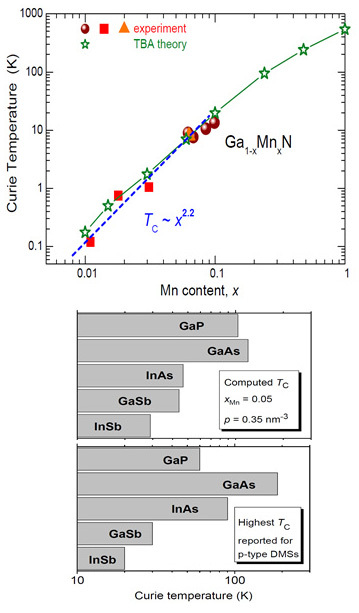 Bottom panel: Curie temperature in semi-insulating Ga1-xMnxN driven by ferromagnetic superexchange computed within the tight-binding approximation (TBA) and Monte Carlo simulations [Sylwia Stefanowicz et al. Phys. Rev. B 88, 081201(R) (2013)]. Another achievement is the elucidation of the origin of high temperature ferromagnetism in semiconductors and oxides reported by various groups in thousands of papers. As argued by Dietl et al. [Rev. Mod. Phys. 87, 1311 (2015)], this robust ferromagnetism results from aggregation of magnetic cations (if not introduced on purpose, present due to contamination), i.e., the existence of nanoregions with a large concentration of the magnetic constituent showing , thus, high magnetic ordering temperature. This conclusion is gained from nano-characterization works [see, e.g., Alberta Bonanni Semicond. Sci. Techn. 26, 060301 (2011)], high-precision SQUID measurements at IFPAN [Maciej Sawicki et al., Semicond. Sci. Techn. 26, 064006 (2011)], and ab initio studies, carried out at IFPAN and by other groups. Discoveries of 2D topological insulators [Markus König et al., Science 318, 766 (2007)] and of Majorana fermions [Vincent Mourik et al., Science 336, 1003 (2012)] were preceded by mastering epitaxy of quantum wells and nanowires, respectively. Along with developing growth techniques of various bulk magnetic materials with inverted band structures [(Hg,Mn)Se, (Pb,Sn,Mn)Te, …], IFPAN started at the beginning of the 1990’s a comprehensive programme to build up molecular beam epitaxy of low-dimensional II-VI nanostructures containing Mn ions (heterostructures, nanowires, quantum dots – groups of Grzegorz Karczewski, Jacek Kossut, Tomasz Wojtowicz) and their processing by electron beam lithography (Tomasz Dietl, Jerzy Wróbel). In addition to extensive measurements in Warsaw, often down to mK in Dietl’s lab, the samples grown at IFPAN, owing to their world-top characteristics, have been studied in a dozen European, American, and Japanese laboratories. Some accomplishments are shown in Figures; many others can be found in a book edited by Jacek Kossut and Jan Gaj (Springer, Berlin, 2010). Figures: Top panel: second spectra s(2) of quantum resistance noise driven by slow dynamics of Mn spins below spin-glass freezing temperature in a mesoscopic wire of Cd0.8Mn0.2Te (inset) [Jan Jaroszyński et al. Phys. Rev. Lett. 80, 5635 (1998)] compared to Michael B. Weissmann’s group data on CuMn [Rev. Mod. Phys. 65, 829 (1993)]. 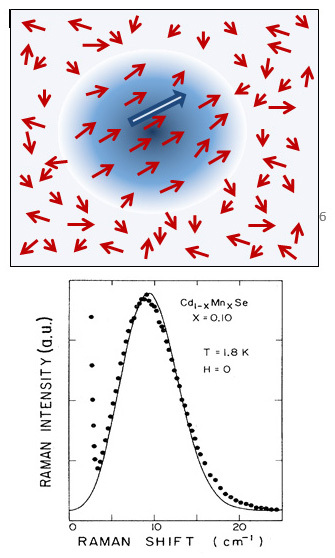 The relatively weak frequency dependence of s(2) indicates droplet excitations as a source of spin dynamics in the dilute antiferromagnet (Cd,Mn)Te. Middle panel: magnetic-field dependent shift of exciton photoluminescence from a single (Zn,Mg)Te/(Zn,Mn)Te core/shell wire, driven by sp-d exchange interaction [Piotr Wojnar et al., Nano Lett. 12, 3404 (2012)]. Bottom panel: Fractional quantum Hall effect in a modulation doped heterostructure of Cd0.0076Mn0.0024Te with electron mobility above 105cm2/Vs [Christian Betthausen et al., Phys. Rev. B 90, 115302 (2014)]. Particularly unique and relevant to the physics of Majorana anyons are high electron mobility modulation-doped quantum wells of (Cd,Mn)Te, in which giant s-d exchange splitting enabled the observation of quantum Hall ferromagnetism [Jan Jaroszyński et al. Phys. Rev. Lett. 89, 266802 (2002)], Landau-Zener transitions between spin sublevels [Christian Betthausen et al., Science 337, 324 (2012)], and specific electron spin waves [Florent Perez et al., Phys. Rev. Lett. 117, 137204 (2016)]. The acquired proficiency in low-temperature methods and high-vacuum techniques was a good starting point to initiate partner collaboration between IFPAN and the highly successful PREVAC company, located in south-west Poland, and specializing in fabricating custom-designed ultra-high vacuum systems, such as MBE, ARPES, XPS, and others. This collaboration is continued and reinforced by MagTop, as PREVAC is one of MagTop’s industrial partners. After his return from Jacek Furdyna’s lab at Purdue, Robert R. Gałązka initiated in 1973 at IFPAN an ambitious program aimed at developing and studying non-magnetic semiconductors heavily doped with magnetic ions. Particularly rewarding was the research on (II,Mn)VI chalcogenides to which, typically, up to 50% percent of Mn could be introduced while preserving excellent structural characteristics. Comprehensive magnetic, magneto-optical, magneto-transport, and theoretical investigations of these systems, carried out at IFPAN, the University of Warsaw, as well as in a number of collaborating groups (notably in France) made it possible to observe and to quantify the influence of sp-d exchange interactions upon the band structures, Landau levels, excitons, and impurity states in bulk and two-dimensional systems. 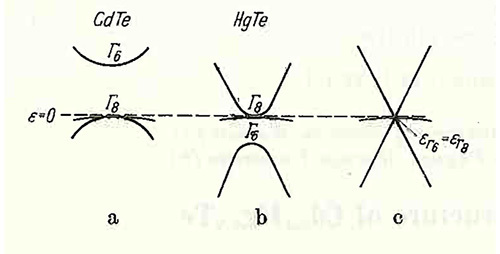 As reviewed by Dietl [Handbook on Semiconductors (1994)], the durable accomplishments encompass the understanding and determination of sp-d and d-d exchange integrals within the multiband kp method and multiorbital tight binding approximation, the observation and theory of bound magnetic polarons (figures), the elucidation of the role of sp-d exchange interactions in quantum localization, and the demonstration of spin-glass freezing in dilute antiferromagnets. Figures: By the s-d exchange interaction the donor electron (dark blue) spin-polarizes Mn spins (red) within the donor Bohr radius. This induced polarization together with thermodynamic magnetization fluctuations generate spin splitting of the electron states that can be probed by spin-flip Raman scattering (bottom panel, points). The Dietl-Spałek model [Phys. Rev. Lett. 48, 355 (1982) ] (solid line) describes with no adjustable parameters the position, shape, and width of the Raman scattering dispersion determined by D.L. Peterson et al. [Phys. Rev. B 32, 323 (1985)] at Purdue. Successful growth of high-quality dilute magnetic semiconductors (DMSs) started by mastering the method of Mn purification. PUREMAT Technologies, IFPAN’s spin-off company headed by Andrzej Mycielski, is now a world-leader in supplying ultra-pure Mn and Mg for semiconductor, spintronic, and display technologies. This company is one of MagTop’s industrial partners. Relativistic effects, such as spin-orbit interaction and mass correction, stand behind the pertinent properties of topological matter, including spin-locking and the appearance of inverted band structures in materials containing heavy elements. At the same time, effective (multiband) Hamiltonians explaining the properties of carriers in solids, particularly in narrow-gap semiconductors, such as InSb, are often formally identical to quantum formulae proposed to describe dynamics of various existing or hypothetical elementary particles in vacuum, as reviewed by Wlodek Zawadzki [arXiv:1701.07067]. While the first notice about the analogy between the four-band model (including spin) equations for narrow-gap semiconductors and the Dirac equation goes back to Leonid V. Keldysh [Zh. Eksp. Teor. Fiz. 45, 364 (1963)], at IFPAN Zawadzki has persistently developed and extended this analogy, also in the reverse direction, for instance, by deriving a formula for the spin magnetic moment of relativistic electrons [Phys. Rev. D 3, 1728 (1971)]. In general, however, four-band models do not suffice to describe quantitatively narrow-gap semiconductors. Accordingly, eight or fourteen band variants were developed at MIT, Ioffe, IFPAN, and other labs in order to tackle the magneto-optical and magneto-transport phenomena in these systems (see Figures). As demonstrated in the last decade, topologically non-trivial states live at the boundaries of materials with inverted band structures, such as Hg-, Bi-, and Sn-based chalcogenides and cadmium arsenide. Building on the progress at IFPAN in the description of transport and magneto-transport properties of narrow-gap semiconductors [W. Zawadzki, Wanda Szymańska, phys. stat. sol. (b) 45, 415 (1971), Adv. Phys. 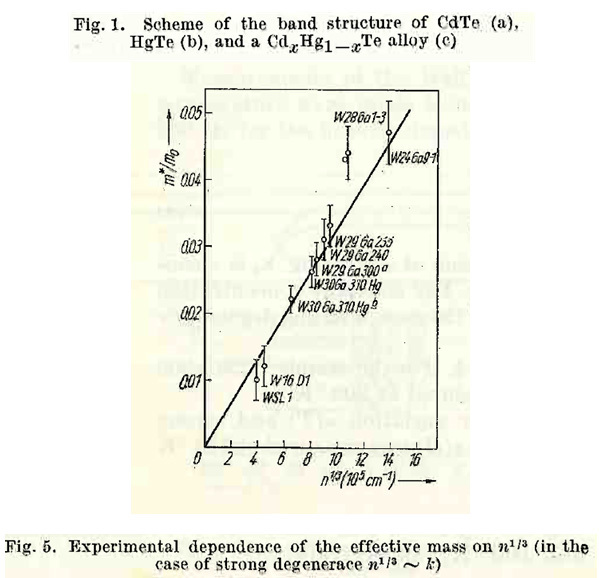 23, 435 (1974)], Tomasz Dietl and co-workers extended the theoretical and experimental studies to the inverted band structure region in mercury chalcogenides (see Figures). Following the experimental demonstration at IFPAN that HgTe has an inverted band structure [Ryszard Piotrzkowski et al. [phys. stat. sol. 8, K135 (1965)] (see Fig. 1), Robert R. Gałązka, under supervision of Leonard Sosnowski, grew bulk n-Hg0.9Cd0.1Te and, by measuring the room temperature Seebeck coefficient in high magnetic fields, determined the values of the effective mass m* of electrons as a function of their concentration n [phys. stat. sol. 20, 113 (1967)]. [Leonard Sosnowski (1911-1986), when at Malvern (UK), explained how p-n junctions and photovoltaic phenomena work [Nature 158, 28 (1946); ibid 159, 818 (1947); ibid 160, 471 (1947)]; later he was the director of IFPAN and was elected as President of the International Union of Pure and Applied Physics for the term 1978–1981]. As shown in Fig. 5 (figure numbering from the original publication), m* measured by Gałązka increases linearly with the Fermi momentum kF, proving a linear (Dirac) dispersion, E(k) = vfk. Amazingly, the Fermi velocity vf = 1.1×108 cm/s determined from this plot is within 10% of the graphene value. Despite the lack of topological protection, fine tuning of the energy gap to the Dirac point by hydrostatic pressure made it possible to observe electron mobility as high as 2×107 cm2/Vs in Hg0.94 Mn0.01Te by M. Sawicki et al. [Conf. Proc., Grenoble 1982]. These discoveries triggered the establishment of Vigo System, a stock-exchange global company located in Warsaw’s area, which has been producing since decades top-level infrared detectors. This company is one of MagTop’s industrial partners.